The solar elements in this sequence were taken at 5 minutes interval except the diamond rings which were about one minute before and after the max totality. The positions of those elements roughly represents the actual position at on the sky. 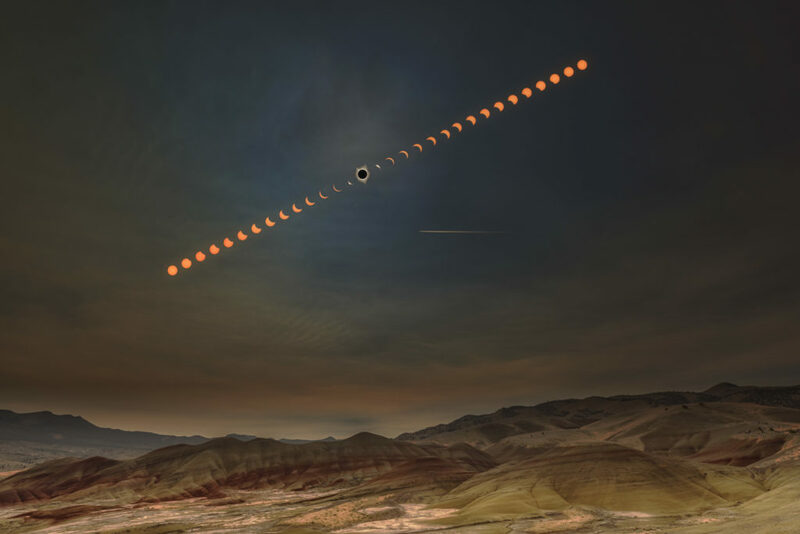 The photographer carefully planned the camera location so that the totality is just above the highest hill. Since this is a wide angle shot, the actual Sun size is way too small so he increased the size by roughly two to three times that you can at least see the eclipse shape. The bright line on the sky is an airplane which flew by the sky right after the totality. 2018 Sony World Photography Awards.